Priscilla attends the premiere of the Brazilian horror film The Trace We Leave Behind, a.k.a. O Rastro. 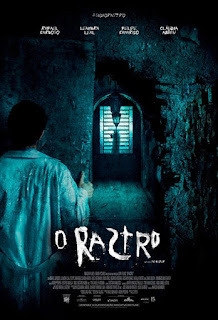 Last year Cody, my husband Esten and I were invited to visit the set of The Trace We Leave Behind (O Rastro), which is the first Brazilian horror movie of its type. José Mojica Marins is the pioneer of horror movies in Brazil with his beloved character Zé do Caixão (Coffin Joe), and while his movies are entertaining and have some international recognition, they don't consist of big budgets and big productions. I could name some other very entertaining Brazilian horror movies, but the fact is that director J.C. Feyer and producers Malu Miranda and André Pereira were entering uncharted territory with this bold project, and we got to spend time with the three of them and the lead actors Leandra Leal and Rafael Cardoso on the set. Right away it became clear to us that they were making something very special and unique, and we couldn't wait to see the final product. The time came, and we were invited to the premiere. Unfortunately, for devastating reasons beyond our control, Cody couldn't make it, but Esten and I made sure to represent him, popcorn and diet soda in hand, and here are my thoughts on the film. 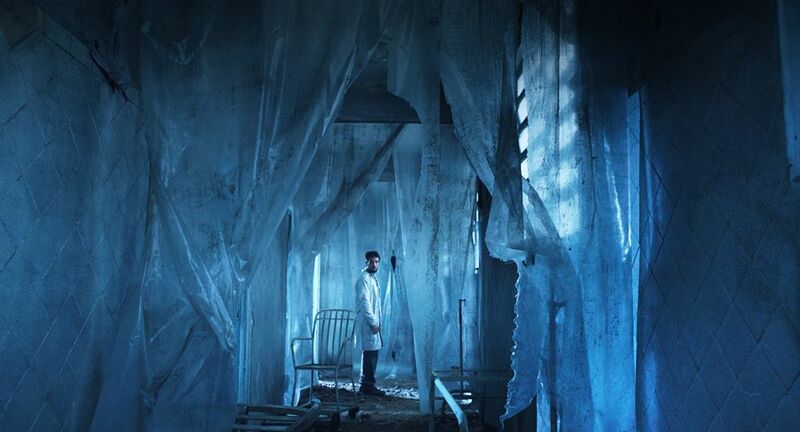 It's about a doctor named João (Rafael Cardoso), who's responsible for closing up an old hospital in Rio de Janeiro, and moving its last patients to other locations. The Trace We Leave Behind follows João during a very hectic time in his life. There are changes both already in place with the new job he's assigned to do and on the way, with his wife Leila (Leandra Leal) expecting their first child. The fact that he is about to experience fatherhood for the first time is something that is more than enough to change someone's overall perspective. He's a doctor, and doctors take oaths to save lives, to do what they can to help people, so there's a bit of a conscience struggle going on with his new job; on one hand he has to think about the future and all the responsibility that comes with having a baby while doing his best to succeed at this job, and on the other hand there's the sadness that comes with closing a hospital, especially the one owned by Heitor (Jonas Bloch), who's such a close friend he's almost like a father figure to João. With all of this in motion, João is already stretching himself thin, trying to do his best in every aspect of his life, when he finds out that a new patient has been admitted to the hospital. Ultimately it's his decision what to do with the patient, and he decides to keep her until she can be placed somewhere else. The new patient is Julia (Natália Guedes), a 10-year-old girl who's alone and scared. Julia and João instantly bond, and he takes it upon himself to assure her that she'll be taken care of. Making promises to Julia and to Leila, there's a lot for João to handle, and you can obviously see that he's slowly starting to crumble. If all that wasn't enough, after the remaining patients are moved to other places João finds out that Julia is missing. He can't seem to find her anywhere, and once his search begins, he gets closer and closer to losing his sanity, making discoveries that are too dark to believe. The plot thickens with every bit of information he finds. Unveiling these awful secrets comes with a price, and João starts to go through a state of mind deterioration, which spreads to Leila, who desperately wants to help her husband but doesn't know how. She's forced to embark on a journey of her own. Acting is one of the many highlights of the movie for me. Leila and João are fantastic characters, the type that every talented actor should get to play at least once in their career. Some of their scenes are so emotionally charged, you can't help but get involved and root that they'll overcome the obstacles they're faced with. Even though I haven't watched Brazilian television in decades and I'm not exactly an expert when it comes to Brazilian movies, I had no doubt that Leandra Leal would live up to her reputation as an accomplished actress, and she really did. She brings everything the role requires: vulnerability, desperation, strength, depth, anguish, it's all there. Rafael Cardoso was a huge surprise to me. Not only is he the sweetest, most humble guy in person, he's also an extremely gifted actor. His performance as João was amazing. He has so much range, and I'll be looking forward to seeing what he does next. Casting really was impeccable, everyone delivered solid, believable performances, including Jonas Bloch, Cláudia Abreu, Felipe Camargo, and the late Domingos Montagner, who plays a very important part in the movie. The score and sound effects are outstanding. What is usually off-putting for me when it comes to Brazilian productions is the sound, and I was pleasantly shocked by the high quality of those aspects in The Trace We Leave Behind. They're deeply effective, and that makes all the difference in a movie like this. Same goes for photography. There are some unusual, yet very interesting shots and angles. The movie is so visual, it bathes in style. It's something else that adds to the greatness of it all. To come up with a script that tells so many stories in one and still gets the point across without being confusing or overwhelming is not an easy task, but screenwriters Beatriz Manela and André Pereira (who's also one of the nicest people you could ever hope to meet) pulled it off. I got so invested in the characters, I wanted a spin-off movie featuring pretty much every one of them separately. And to have a story aimed at the critical political situation our country is in is brilliant. What better way to start this movement consisting of Brazilian horror movies with big budgets and productions than to bring it close to home? Ideal. It's just political enough, without getting stuck on that aspect alone. Some of the characters have had to make shady "deals" and less than righteous decisions to make ends meet, which is something that is not exclusive to people in Brazil. Also the way the story is told, which has a lot to do with J.C. Feyer's direction, works quite well. Bit by bit you find yourself falling deeper and deeper into this nightmarish ordeal. It's a journey. Which brings me to pace...some people might say the movie is slow at times, and even though it didn't feel that way to me, I can see why, but only at the beginning. During the first 10 minutes or so, when the movie is still starting to establish its purpose, it could seem like it's going to be too political, or that not a lot is going to happen, but that gets dissolved fast, and there are multiple stages to the story. I feel like the running time and the pace worked. I wouldn't have changed it, it's the best way to tell a story like this. 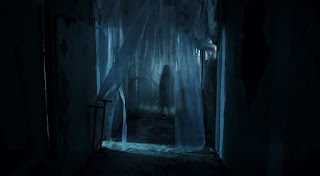 During the set visit last year we learned that the director and the producers have flawless taste in horror movies, so it's to be expected that there would be influences and references, but there's nothing palpable that gives you the feeling of knowing you saw a certain scene somewhere else before. 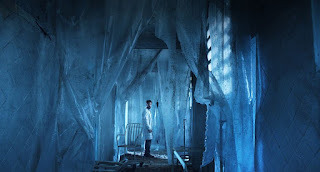 The gorgeous blue tint from The Orphanage? The tense and chaotic vibe from The Babadook? Maybe, but nothing blatant; The Trace We Leave Behind is its own creature, and it has twists that I did not see coming. I can do without too many jump scares and CGI, and although there are a few in the film, it doesn't get distracting or annoying. The one jump scare with Julia at the end seemed a bit unnecessary to me, but nothing that tarnished the movie in any way as a whole. Same with the effects. It's mostly subtle and justified, and there's one very raw scene that was almost too much for me, and I grew up watching horror movies. I'm still wondering how they shot it. I also got goosebumps with a couple of scenes, which is not something that happens to me all that often. The Trace We Leave Behind has a special meaning to me, because we had the greatest time visiting the set and meeting such gracious, down-to-Earth, generous people. It's a very peculiar feeling when you see those places on the big screen and you've actually been there. Seeing the characters sweat during the movie, and being reminded of how sweaty I actually was that night in the hospital. Some of the narrow passages and staircases, and the fact that the hospital is such a perfect location, it's a character on its own. But I can't be biased, and I'm not. I'm very honest about my feelings and opinions, I have lost "friends" over this very fact. So, this is how I truly feel about the movie... it has soul, it has a voice. It's thrilling, engaging, and visceral like you wouldn't believe! Watch it! If you're into horror, watch it for that. If not, there's probably something in it for you. The movie could be described as a psychological thriller with supernatural and political elements. Now, if you're looking for comedy, this is not the movie for you. It's tense, serious, it does not joke around. This film makes me hopeful and excited about the future for horror (movies, not political situation) in Brazil and also makes me look forward to Feyer's, Miranda's, and Pereira's next projects.